Artist Jerry Butler created the work for the Central Library “Angels and Demons” show in less than a year. Butler wanted to show the “angels” who’d supported him — mostly women, like his late sister Ronnie and his Aunt Wilma who died in a car accident when she was in her 20s — and the demons of his darker side, ghouls of self-doubt, fear and procrastination. Artist Jerry Butler stands between a portrait of his brother called “Boxed with Internal Demons” (left) and “Student: Angel or Demon” (right) at the Madison Central Library on Jan. 4, 2019. “Self-Portrait with Angels and Demons” prominently features Ada the mule. "VT and the Blue Notes at the Dew Drop Inn" by Jerry Butler is featured in his new show, "Angels and Demons," at the Central Library. A portrait of his brother called "Boxed with Internal Demons" by Jerry Butler is featured in Butler's new show, "Angels and Demons," at the Central Library. “Movie Star” highlights the vivacious personality of Jerry Butler’s late wife, Jeanette. "Angel of Discipline" by Jerry Butler has "a lot of demon figures in it," he said. "In her face, she's reconciled herself to these beings ... around or in her. I can get a lot out of a partial image." Jerry Butler has a new show, "Angels and Demons," at the Central Library, running through the end of January. An old girlfriend and some Japanese gilt-edged paper came together for "Woman in Red Dress in the Window at the Dew Drop Inn" by Jerry Butler, now on view at the Central Library. "Angel of Empathy" is part of Jerry Butler's new show, "Angels and Demons," at the Central Library through the end of January. Jerry Butler made all new work for his show "Angels and Demons," at the Central Library through the end of January. 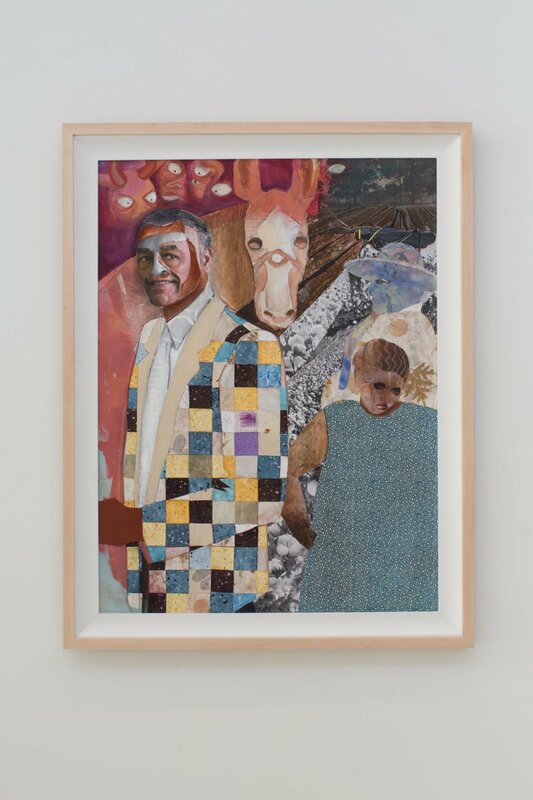 "Touch 2," created with scraps of a painting by his daughter Vanessa, is part of Jerry Butler's new show, "Angels and Demons," at the Central Library through the end of January. “The Barber” is a portrait of Butler’s father when he was about 50. Jerry Butler made a series of new works, including “Boxed with Internal Demons,” for his new show at the Central Library. “Every time I have a show I see if I can produce new works for that show,” Butler said. Jerry Butler's youngest sister, Ronnie, shows up frequently in his work, including in this piece, "Angel of Discipline." Artist Jerry Butler stands among images in his new show, "Angels and Demons," featured at the Madison Central Library through Jan. 31.